And another reminder that I am a patient – not a medical person. My comments are based on my own experiences and others and I take full responsibility for my opinion and perceptions. My hope is that patients will speak up and question the medical people trying to help us when need be. They can’t help us without an open and honest dialog. That said, Lymphedema treatment is available. Finding the right help at the right time is not easily available and getting the right treatment for the right diagnosis is sometimes difficult. So is finding the right medical help match for a patient yet both are key to a patient’s survival and the best quality life possible. Did you ever wonder how many frogs the fabled Princess kissed before she found the right frog? Well, if frogs were medical providers, patients occasionally need to kiss lots of frogs to get the right match. Lymphedema is nasty stuff and I was sorry to learn lymphedema can be a real problem for cancer patients, especially breast cancer. Lower leg lymphedema disease is apparently different though since cancer caused lymphedema support groups don’t allow ‘regular’ lymphedema patients to join. I know because I looked for close by lymphedema support groups and learned Harrison Medical Center had one. I called to ask if I could attend a lymphedema support group session and the Harrison spokesperson didn’t think so. She did promise to ask at the next meeting and let me know. That was several months ago. During the pleasant phone conversation, Harrison’s spokesperson asked how I knew I had lymphedema and I had to say I assumed it was caused from years of ignoring edema and pitted edema. Her question stayed with me though and I recently asked my pulmonologist at the University of Washington Medical Center what caused it and his answer surprised me “Sleep Apnea” …something to do with ‘insufficiency’…wow, Dr. Christopher Goss, I need to learn more about that! Harrison Medical Center’s Lymphedema Support Group is limited only to cancer patients? JAMA. 2010 Dec 8. Weight Lifting for Women at Risk for Breast Cancer-Related Lymphedema: A Randomized Trial. Schmitz KH, Ahmed RL, Troxel AB, Cheville A, Lewis-Grant L, Smith R, Bryan CJ, Williams-Smith CT, Chittams J. University of Pennsylvania School of Medicine and Abramson Cancer Center, Philadelphia (Drs Schmitz and Troxel and Mss Lewis-Grant, Bryan, and Williams-Smith and Mr Chittams); Department of Dermatology, University of Minnesota Medical School, Minneapolis (Dr Ahmed); Physical Medicine and Rehabilitation, Mayo Clinic, Rochester, Minnesota (Dr Cheville); and Department of Physical Medicine and Rehabilitation, University of Pennsylvania School of Medicine, Philadelphia (Drs Cheville and Smith). December 17, 2010 — A slowly progressive weightlifting program for breast cancer survivors does not increase the risk for lymphedema, according to the results of a randomized controlled equivalence trial reported online December 8 in the Journal of the American Medical Association. The goal of the study was to compare onset of lymphedema after a 1-year weightlifting intervention vs a no-exercise control group among survivors at risk for breast cancer–related lymphedema (BCRL) who were enrolled in the Physical Activity and Lymphedema trial. Lymphedema is an abnormal accumulation of protein-rich fluid (lymph Fluid) and specialized cells (fibroblasts, keratinocytes) in the spaces between tissues throughout the body. When the lymphatic Fluid cannot be readily moved from the extremity to the trunk swelling is seen in the limb. Lymphedema may be primary or secondary. Primary is when swelling is the result of lymph vessels that are too small, too few in number or too wide so the valves cannot work properly. Secondary occurs from some kind of damage to the system. This could include surgery for lymph node removal, radiation to treat cancer, trauma or parasites that block the lymphatic vessels. 3. What are the symptoms of Lymphedema? Symptoms include tightness, swelling or thickening anywhere in the trunk or extremity, feelings of heaviness in the extremity, difficulty fitting into clothing in one specific area. Swelling may increase with activity and decrease with rest. 4. Why did I get Lymphedema? Medical science is not able to determine why one person gets lymphedema and the next person does not. It probably has to do with the number of lymphatics you had originally and what percentage are not working. Lymphedema is not curable; however, it is manageable with treatment. 6. What kind of treatment is available for Lymphedema? There is a treatment approach called Complex Decongestive Physiotherapy(CDP). This method consists of several parts including manual lymphatic drainage, bandaging, proper skin care, compression garments, remedial exercises, and self-manual lymphatic drainage and bandaging. This treatment can be done by a physical therapist that has extensive training in the subject. 6. What happens if Lymphedema is not treated? Lymphedema is chronic and progressive. If it remains untreated the protein-rich fluid continues to accumulate which could lead to increased swelling and hardening (fibrosis) of the tissues. The protein-rich fluid is a perfect environment for bacteria to flourish which could lead to recurrent infections. Untreated lymphedema can also lead to skin breakdown and loss of motion in the joints of the affected limb. We have one life and, my opinion, a patient’s best bet is to get educated about whatever we have and learn how to best handle it. Kitsap County Library System has a book on Caregiving for Lymphedema at the main library. Melissa at the Center for Orthopedic & Lymphatic Physical Therapy in Port Orchard mentioned using a soft baby brush to clean the affected skin and it worked fine once my husband duck taped the baby brush to a section of pvc pipe. The extra length makes leaning over easy for a lung patient and he made two – the second one I use to apply the skin lotion. Dry skin cracks too easily for lymphedemia’ites. I thought you’d enjoy seeing this old car photo. December 2009 I was rushing to Harrison Silverdale ER but had to stop to take this photo! 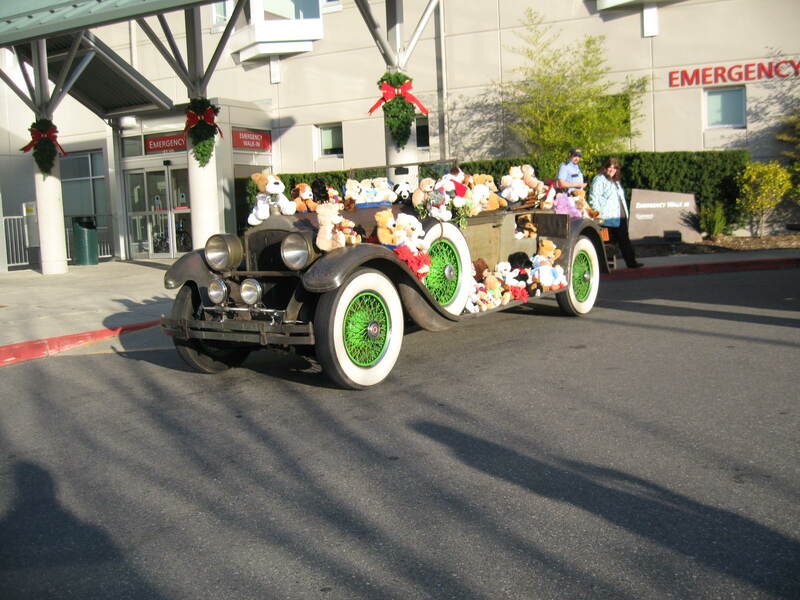 I don’t know why the old car was there, what kind of car it is, who owned it or why it was parked with the stuffed critters outside the ER.